William was born in Killoe, and his residence is recorded as being Carryglas [sic] on his military record. He is recorded as enlisted for war service, most likely with the Royal Irish Regiment in Hamilton, likely on transfer from the Royal Dublin Fusiliers to the RIR. The fact that he was posted to the 7th, South Irish Horse battalion suggests that he may have had experience with horses, or saddlery, prior to this. William was awarded the Military Medal (M.M.) for bravery the month he died. He was killed in action near St. Genois, likely during the final 100 Days Offensive. His widow, Mary, was his next-of-kin. 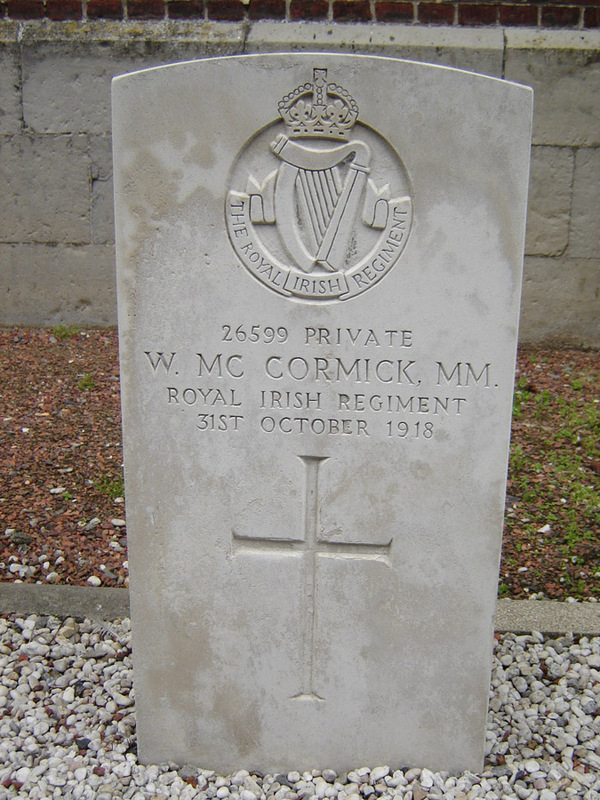 Unfortunately, Pte McCormick's file is not accessible, and may have been destroyed in WW2, therefore it is difficult to ascertain more information on him or his family.